For other uses of "Saratov", see Saratov (disambiguation). Saratov (Russian: Сара́тов, IPA: [sɐˈratəf] ( listen)) is a city and the administrative center of Saratov Oblast, Russia, and a major port on the Volga River located upstream (north) of Volgograd. Population: 837,900 (2010 Census); 873,055 (2002 Census); 904,643 (1989 Census). The name Saratov may be derived from Sary Tau (Сары Тау), meaning "Yellow Mountain" in the Tatar language. Another version of the name origin derives it from the words Sar Atau, which means the "Boggy Island". Uvek, a city of the Golden Horde, stood near the site of the modern city of Saratov from the mid-13th century until its destruction by Tamerlane in 1395. While the exact date of the foundation of modern Saratov is unknown, all plausible theories date it to ca. 1590, during the reign (1584–1598) of Tsar Fyodor Ivanovich, who constructed several settlements along the Volga River in order to secure the southeastern boundary of his state. Town status was granted to it in 1708. By the 1800s, Saratov had grown to become an important shipping port on the Volga. The Ryazan-Ural Railroad reached Saratov in 1870. In 1896 (26 years later), the line crossed the Volga and continued its eastward expansion. A unique train-ferry, owned by the Ryazan-Ural railroad, provided the connection across the river between the two parts of the railroad for 39 years, before the construction of a railway bridge in 1935. During January 1915, with World War I dominating the Russian national agenda, Saratov became the destination for deportation convoys of ethnic Germans, Jews, Hungarians, Austrians and Slavs whose presence closer to the western front was perceived as a potential security risk to the state. During World War II, Saratov was a station on the North-South Volzhskaya Rokada, a specially designated military railroad supplying troops, ammunition and supplies to Stalingrad in 1942-1943 the city was bombed by German aircraft the main target was the Kirov oil refinery bombarded heavily seriously damaging the installation and destroying 80% of its plant and temporarily interrupting its work. The Luftwaffe was able to destroy all the fuel stock at bases in Saratov and eliminate the oil plant in the city..
Until the end of the Soviet Union in 1991, the Soviet authorities designated Saratov a "closed city"—strictly off-limits to all foreigners due to its military importance as the site of a vital facility manufacturing military aircraft. The city of Saratov played an important role in the history of the Volga Germans. Until 1941, the town of Pokrovsk (present-day Engels), located just across the Volga from Saratov, served as the capital of the Volga German Republic. The ethnic German population of the region numbered 800,000 in the early 20th century, with some people whose families had been there for generations. Beginning with Catherine the Great's 1763 Manifesto promising land, freedom from military conscription and religious freedom, the Russian Emperors invited German immigration in the 18th and 19th centuries to encourage agricultural development. The Volga German community came to include industrialists, scientists, musicians and architects, including those who built Saratov's universities and conservatories. After the beginning of the German invasion of the Soviet Union in June 1941, the Soviet government forcibly expelled the Volga Germans to Uzbekistan, Siberia and Kazakhstan (September 1941); few ever returned to the Volga region, even after rehabilitation. Others were expelled to western Europe after World War II ended in 1945. Beginning in the 1980s, a large portion of the surviving members of the ethnic Germans emigrated from the Soviet Union to Germany. Reminders of the once prominent place of Germans in the city remain, with the Roman Catholic St. Klemens Cathedral (seat of the historic Diocese of Tiraspol) on Nemetskaya Ulitsa ("German Street") the most notable. The building designed by Mikhail N. Grudistov (b. 1839 — d. 19 February 1914, who also designed the State Bank Building in Saratov still standing on the corner of Radishchev and Sovetskaya streets) was converted into the children's cinema "Pioneer" during the Soviet period. A new cathedral was built in 2000 elsewhere in the city: the Cathedral of the Holy Apostles Peter and Paul in Saratov [de]. Saratov is the administrative center of the oblast and, within the framework of administrative divisions, it also serves as the administrative center of Saratovsky District, even though it is not a part of it. As an administrative division, it is incorporated separately as the city of oblast significance of Saratov—an administrative unit with the status equal to that of the districts. As a municipal division, the city of oblast significance of Saratov is incorporated as Saratov Urban Okrug. Saratov has a moderately continental climate with warm and dry summers and an abundance of sunny days. The warmest month is July with daily mean temperature near +23 °C (73 °F); the coldest is February, at −8 °C (18 °F). Summers are hot and dry in Saratov. Daytime temperatures of +30 °C (86 °F) or higher are commonplace, up to +40.9 °C (105.6 °F) during a heat wave in 2010. Snow and ice are dominant during the winter season. Days well above freezing and nights below −25 °C (−13 °F) both occur in the winter. Saratov Oblast is highly industrialized, due in part to the richness in natural and industrial resources of the area. The oblast is also one of the more important and largest cultural and scientific centers in Russia. Saratov possesses six institutes of the Russian Academy of Sciences, twenty-one research institutes, nineteen project institutes, as well as the Saratov State University, the Saratov State Socio-Economic University, the Saratov State Technical University, and many scientific and technological laboratories attached to some of the city's large industrial enterprises. Saratov is served by the Saratov Tsentralny Airport. The airport has flights to some international destinations and other Russian cities. Saratov West is a general aviation airfield. The aerospace manufacturing industry is served by the Saratov South airport. Nearby Engels-2 (air base) is the main base for Russian strategic Tu-95 and Tu-160 bombers. Motorways link Saratov directly to Volgograd, Samara, and Voronezh. The railways also play an important role. The Privolzhskaya Railway is headquartered in Saratov. The Volga itself is an important inland waterway. Buses and trolleybuses form the backbone of public transport in the city. Saratov is host to a number of colleges and universities. These include the Saratov State University (1909), Saratov State Technical University, Saratov State Medical University, Saratov State Academy of Law and Saratov State Agrarian University . In 2014 a newly renovated campus for the Saratov Regional College of Art was opened. One of the city's most prominent landmarks is the 19th century neo-Gothic Conservatory. When it was built in 1912, the Conservatory was Russia's third such institution (after Moscow and St. Petersburg). At the time, Saratov, with a population of 240,000, was the third-largest city in Russia. The main building of the conservatory had been built in 1902 by architect Alexander Yulyevich Yagn, and originally it housed a music school. Before the opening of the conservatory in 1912, the building was reconstructed by the architect Semyon Akimovich Kallistratov. When Saratov Conservatory opened in September 1912, it immediately had 1,000 students ready to begin their studies. The Saratov Drama Theater was founded in 1802, making it one of Russia's oldest. It is ranked as one of Russia's National Theaters. In Soviet times, the theater was renamed in honor of Karl Marx, but now carries the name of Ivan Slonov (1882–1945), an actor, theatrical director and educator, born in the city. The full name in Russian is The I. A. Slonov Saratov State Academic Theater (Саратовский государственный академический театр драмы имени И. А. Слонова). Saratov is noted for several art museums, including the Radishchev Art Museum, named for Alexander Radishchev, Fedin Art Museum, named after Russian novelist Konstantin Fedin, Saratov Local History Museum, Chernyshevsky Estate Museum, named for Nikolay Chernyshevsky, and some others.. It contains more than 20,000 exhibits, including ancient Russian icons, as well as works by some of the finest Russian painters (e.g. Aleksandra Ekster, Pavel Kuznetsov, Aristarkh Lentulov, Robert Falk, Pyotr Konchalovsky, Martiros Saryan, Fyodor Rokotov). More than 90% of the city's population are ethnic Russians. Among the remainder are Tatars, Ukrainians, Armenians, Kazakhs and others. Zedd (musician), music producer and DJ, born in Saratov and moved to Germany. ^ The official symbols of Saratov enumerated in Article 3 of the Charter of Saratov do not include the anthem. ^ a b c d Энциклопедия Города России. Moscow: Большая Российская Энциклопедия. 2003. pp. 409–410. ISBN 5-7107-7399-9. ^ a b c Государственный комитет Российской Федерации по статистике. Комитет Российской Федерации по стандартизации, метрологии и сертификации. №ОК 019-95 1 января 1997 г. «Общероссийский классификатор объектов административно-территориального деления. Код 63 243», в ред. изменения №278/2015 от 1 января 2016 г.. (State Statistics Committee of the Russian Federation. Committee of the Russian Federation on Standardization, Metrology, and Certification. #OK 019-95 January 1, 1997 Russian Classification of Objects of Administrative Division (OKATO). Code 63 243, as amended by the Amendment #278/2015 of January 1, 2016. ). ^ "Путешествие по России" [Travel to Russia] (in Russian). Archived from the original on May 14, 2013. Retrieved December 29, 2008. ^ Sergej G.: Die Politik Russlands gegenüber den Deutschen 1914–1918. In: Eisfeld, Alfred et al. [Hrsg.] Deutsche in Russland und in der Sowjetunion 1914–1941. Lit Verlag, Berlin 2007. ^ a b Государственный комитет Российской Федерации по статистике. Комитет Российской Федерации по стандартизации, метрологии и сертификации. №ОК 019-95 1 января 1997 г. «Общероссийский классификатор объектов административно-территориального деления. Код 63 401», в ред. изменения №278/2015 от 1 января 2016 г.. (State Statistics Committee of the Russian Federation. Committee of the Russian Federation on Standardization, Metrology, and Certification. #OK 019-95 January 1, 1997 Russian Classification of Objects of Administrative Division (OKATO). Code 63 401, as amended by the Amendment #278/2015 of January 1, 2016. ). ^ Climatological Norms of Saratov . Retrieved on August 24, 2011. Саратовская областная Дума. Закон №46-ЗСО от 2 июня 2005 г. «Устав (Основной Закон) Саратовской области», в ред. Закона №54-ЗСО от 28 апреля 2015 г. «О внесении изменений в Устав (Основной Закон) Саратовской области». Вступил в силу после официального опубликования. Опубликован: "Неделя области", Спецвыпуск, №38 (156), 4 июня 2005 г. (Saratov Oblast Duma. Law #46-ZSO of June 2, 2005 Charter (Basic Law) of Saratov Oblast, as amended by the Law #54-ZSO of April 28, 2015 On Amending the Charter (Basic Law) of Saratov Oblast. Effective as of after the official publication.). Саратовская городская Дума. Решение №67-649 от 18 декабря 2005 г. «Об Уставе муниципального образования "город Саратов"», в ред. Решения №48-544 от 30 июля 2015 г. «О внесении изменений в Устав муниципального образования "город Саратов"». Вступил в силу 1 января 2006 г. (за исключением отдельных положений). Опубликован: "Саратовская панорама", Спецвыпуск, №14 (44), 20 декабря 2005 г. (Saratov City Duma. Decision #67-649 of December 18, 2005 On the Charter of the Municipal Formation of the "City of Saratov", as amended by the Decision #48-544 of July 30, 2015 On Amending the On the Charter of the Municipal Formation of the "City of Saratov". Effective as of January 1, 2006 (with the exception of certain clauses).). Саратовская областная Дума. Закон №21-ЗСО от 3 апреля 2000 г. «Об административно-территориальном устройстве Саратовской области», в ред. Закона №15-ЗСО от 4 февраля 2014 г. «О внесении изменений в Закон Саратовской области "Об административно-территориальном устройстве Саратовской области"». Вступил в силу со дня официального опубликования. Опубликован: "Саратовские вести по понедельникам", №12 (12), 10 апреля 2000 г. (Saratov Oblast Duma. Law #21-ZSO of April 3, 2000 On the Administrative-Territorial Structure of Saratov Oblast, as amended by the Law #15-ZSO of February 4, 2014 On Amending the Law of Saratov Oblast "On the Administrative-Territorial Structure of Saratov Oblast". Effective as of the day of the official publication.). Саратовская областная Дума. Закон №79-ЗСО от 23 декабря 2004 г «О городских округах». Вступил в силу с 1 января 2005 г. Опубликован: "Саратов — столица Поволжья", №264 (1215), 24 декабря 2004 г. (Saratov Oblast Duma. Law #79-ZSO of December 23, 2004 On the Urban Okrugs. Effective as of January 1, 2005.). Саратовская областная Дума. Закон №78-ЗСО от 23 декабря 2004 г «О муниципальных районах». Вступил в силу с 1 января 2005 г. Опубликован: "Саратов — столица Поволжья", №267–268 (1218–1219), 29 декабря 2004 г. (Saratov Oblast Duma. Law #78-ZSO of December 23, 2004 On the Municipal Districts. Effective as of January 1, 2005.). 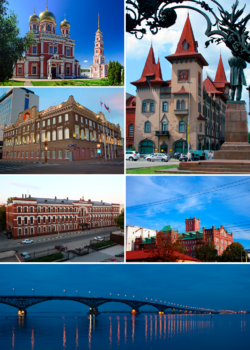 Wikivoyage has a travel guide for Saratov.